Pull-up banners. Pop-up banners. Roll up stands. 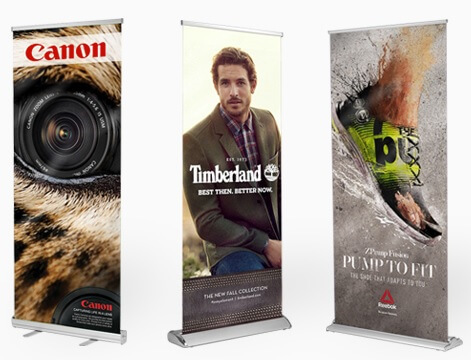 Retractable banner stands. Whatever you call them... Well-known for their portability and versatility, banner stands are ideal for trade shows, festival events, lobbies & waiting areas, book signings, DJ set-ups, autograph sessions, and any retail environment. There are many types and sizes to choose from depending on your need. No minimum orders & no catch: Our banner stand prices include the hardware + the print + carry bag. Bulk pricing available - come save!